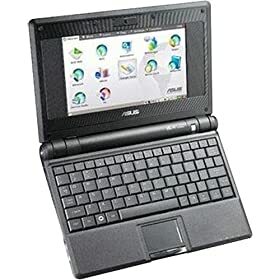 If I could have a “do over” on my laptop purchase from last November, I would have gotten one of these Asus Eee laptops. I want my laptop to be portable – I’m willing to sacrifice a faster processor for a small laptop. When it comes to laptops, my opinion is smaller is better. If I could have multiple command line windows open on my Treo, I’d just use that as my portable computer. At 6.3 x 8.9 x 0.8 inches & 2 pounds, the Asus Eee laptop seems pretty sweet. I’m pleased about how many reviewers of this laptop on Amazon are happy with Linux on this laptop and never install Windows. Well, our last laptop lasted 6 years, so I’ll probably be shopping around again in 2014 for another laptop.